So there are quite a few points to know about what is not covered in a health insurance plan. Best to understand them better before taking the plan. You will then have no unpleasant surprises. Let me try to categorise them so that it is easy to understand. Most health insurance plans will not cover any treatment costs of any illness in the first 30 days from the date of inception of the policy. Of course, if the hospitalisation is due to an accident, the policy will cover the treatment costs. This list may vary from policy to policy, so best to refer to the policy wordings of the plan to know the exact details. Again, please refer to the Policy Wordings of your policy to know the exact applicable list. At the time of application, insurance companies will ask for any pre-existing illness or health condition which you have. These illnesses will not be covered for a specific period of time. The period of time may vary from 3 to 4 years in most policies. In some policies, it may be for a longer period of time. After the waiting period is over, the treatment for those conditions will be covered. 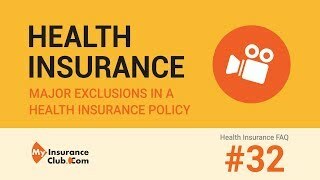 Apart from the General Exclusions, sometimes insurance companies may put a permanent exclusion clause for some of your pre-existing conditions. This is usually done in case, the pre-existing conditions is severe in nature. In such a scenario, your health insurance plan will not pay for any treatment for that illnesses and its related conditions. I hope this was useful In case you have any questions related to this topic, do comment below and we will get back to you.